In the world where people spend most of their time on mobile devices, getting helps still seems hard. When a client approached me to address this, I was intrigued to jumped in. Helping each other is very human thing. We provide and get help from families, friends or even strangers. We wanted to extend this to greater area. We wanted to make people easier to get helps and provide helps. I helped client brainstorm the key ideas, refine the concept, and reshaping the product. 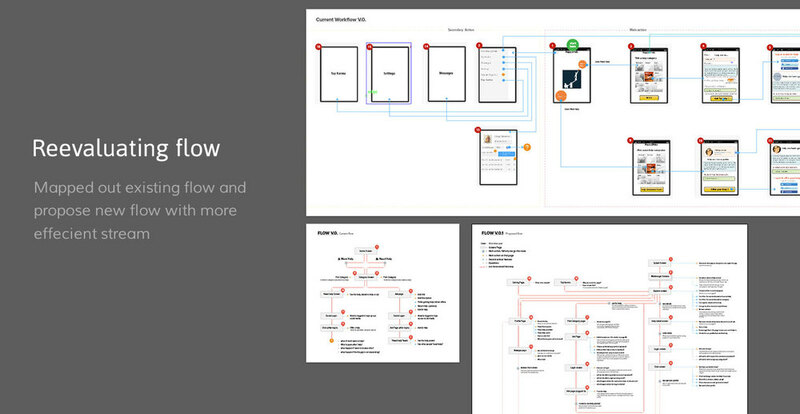 I designed the app workflow, wireframes and pixel precision design. Iterations are performed to ensure all aspects of the apps speak the same language and meet the expectation. Once the proposed flow agreed among the team members, I started to working on first concept of the app. I was inspired to embrace iOS7 guideline and don't do much custom control in order to save time in development phase. It should be light & warm, use clear typography, and focus on content. Then I started the wireframing process. I was starting with the most important pages to the least important. Since the constraint of the project didn't let me spend lot of times on exploring things, I skipped the low-fi and went straight to the hi-fi wireframes (more like early version of the design mockup). I use sketch app because it lets me measure things easily. Once most of the screens are there, team members provide constructive feedback based on agreed user flow. Later, we came up with some feedbacks to improve the app. We used basecamp to make our communication easier. 32 threads discussion created, 24 files shared and we used dropbox to store and sync all design manifests. To save time in the tight deadline, instead do the improvements on the hi-fi wireframes we decided to incorporate the improvements on the final design. Previously I already create a few color palette that used on the first iterations. But since it's major tone is set in blue, we don't really like it. Plus we feel that we should give more cheer feeling, warm tone to the app. It results with the color palette above and two typefaces: asap & muli. When all is set, it's time to transform the early design to the final design based on the brand guideline and integrate the feedback to the process. The process follow the same flow; start with the important page to the least important. These screens are where user mostly spend a lot of time on the app. We expect people to browse existing helps and see how usually people ask helps. We want to give a quick access to the user to perform main actions which is to give/ provide help. But we also provide another alternative to "book" it or add it to their favorite which we call "interested". You can see how these actions is afforded by using swipe gesture. For this page, I decided to go with grid layout so it's easier for people to browse. This fit where our category is still small. Icons help give exposure & recognize each category easily. Tapping on each category will go to specific category page. Asking for a help should be no brainer. However this can be easily misunderstood on what kind of help that we afford on the platform. To address this, I try to use default caption so people know what they have to write on the title of the help. We also plan to educate this on on boarding screens. I don't want to throw user to different screens to just filling the requirement such as categories & attachment so designing a page with segmented section is decent choice for this. With the new iOS7 trend on the hamburger menu, it leaves us with lot of space to fill. This give us benefit to put more content. We want to give more exposure on people avatar so it's obvious when user logged in or not. Tap on avatar will bring them to profile screen. Inbox is a combination of two submenu. Conversation/ message & activity. I combine this so that user don't have to switch between menu to see their notification. In messages you will see different visual treatment on the list. It's more like combination an inbox & sent message. The top two list is a message/ conversation when you become a HP. The last two messages is a conversation where someone offering you a help. Tap into these, will go the chat page. It's important for us to give a proper exposure the people who helps a lot. This is one of our solution on how to bring people to the app, provide feedback without exchange some profits. We put some badges to users that has karma points in certain level. This help them to get more exposure and motivated to help more people. here, instead using illustration I go straight provide a picture of people trying the app and focusing the picture on the current interface and try to communicate how the interface looks like. I'd love to go crazy and provide more delightful onboarding like educating in time, but it will require more time to develop where we don't have that luxury yet. So this is what I came as a solution. Still reading this? Glad you make it to this point! So I learn few things when designing this app. As a freelancer it's important for you to balance between feature with timeline & budget. Make sure you make an efficient design decision while still provide a win win solution for both. Collaborating & communicating is always important in every aspect of design process. Be flexible & supportive. When the devs need your support & guidance, be available for them because they're the people who gonna make your design comes live. I hope you enjoy this extensive breakdown on my design process.